Customers buying a Samsung Galaxy S6 from Telstra can bundle the smartphone with plans that offer up to 10GB in data and a free subscription to the video-on-demand service Presto. The revised plans come into effect on 9 April and run for a limited time to new and existing customers. Samsung begins globally rolling out its Galaxy S6 on 10 April in 20 markets. The smartphone manufacturer is expected to announce the local availability of the S6 and S6 Edge at a launch event being held today. Extra data is being offered on the Telstra's mobile accelerate-, BYO- and business easy-share plans. Only the top-tier mobile accelerate plans will benefit from additional data. The $95 plan now comes with a total of 6GB, while the $130 plan has increased to 10GB. More data is being offered on Telstra’s BYO plans. The revised $55 and $70 plans under the range come with 2GB and 3.5GB of total data. These 12-month plans do not come with a new smartphone. Telstra is bundling a six-month subscription to Presto Entertainment with the plans. Using Presto is metered and therefore can result in extra costs. 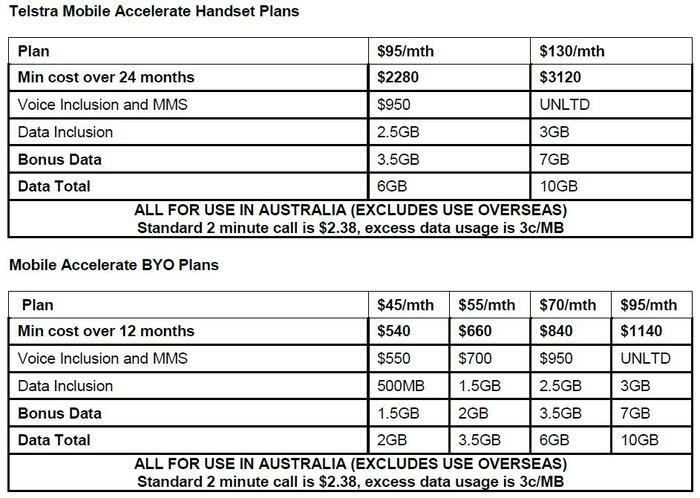 See below for pricing graphs as per the Telstra press release.